As of Evergreen 2.4, the Serial Control View incorporates the Alternate Serial Control interface in the Subscription editor. 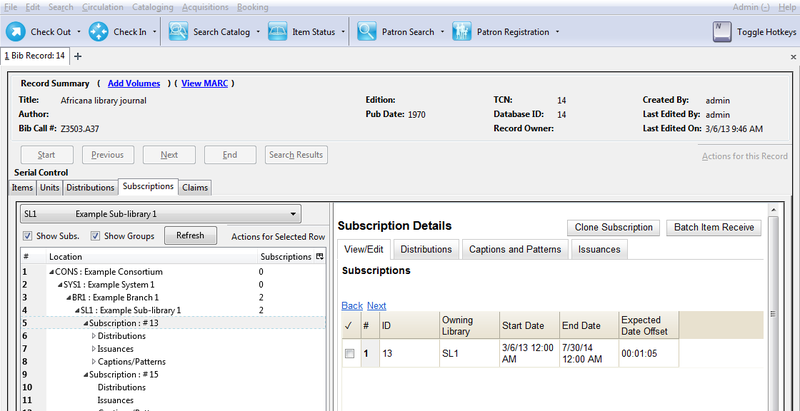 Serial Control View enables you to manage serials in a single tabbed interface. This view also enables you to bind units. Serial Control View consists of five tabs: Items, Units, Distributions, Subscriptions, and Claims. Units and Claims are not functional in 2.4. In the tree on the left, select the branch that will own the subscription. Right-click to show the Actions menu, or click Actions for Selected Row, and click Add Subscription. Enter the date that the subscription begins in the Start Date field. Enter the date that the subscription ends in the End Date field. This field is optional. Enter the difference between the nominal publishing date of an issue and the date that you expect to receive your copy in the Expected Date Offset field. For example, if an issue is published the first day of each month, but you receive the copy two days prior to the publication date, then enter -2 days into this field. When finished, click Save. Or to exit the editor without saving, click Cancel. You can add notes to the subscription by clicking View/Edit Notes. These notes can also be accessed from the Items tab by right-clicking on an item and choosing View Sub. Notes. Also, the Notes column in the Items tab displays the total notes of each kind (Item notes, then Distribution notes, then Subscription notes).